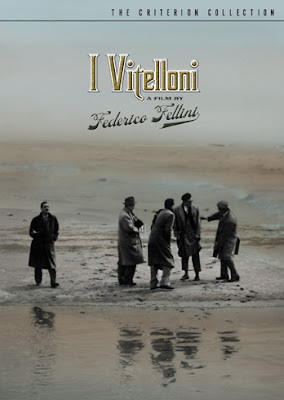 I Vitelloni was Federico Fellini’s third feature, but the first that truly set the Italian maestro on his way to greatness. It provided a transition from his neo-realist roots towards the kind of surreal, carnivalesque and deeply personal statements that would identify his subsequent works. This brilliantly photographed and scored film was also the original slacker movie. Set in his hometown of Rimini, a small and uneventful little town, during the 50s, the story followed the aimless lives of a group of loafers who spend their time doing nothing. Fuasto (Franco Fabrizi) is a serial philanderer even though he is married to his pretty but naïve sweetheart (Claude Farell); Alberto (Alberto Sordi) clowns around town while living with his mother and of his sister’s earnings; Leopoldo (Leopoldo Trieste) is a wannabe playwright with severe lack of self-confidence. Fausto’s brother-in-law Moraldo (Franco Interlenghi), despite being a part of the gang, is the only one with an introspecting and sympathetic nature. And, this shy, soft-spoken and quietly observant lad, the least idiosyncratic of the lot, and possibly a stand-in for the director himself, becomes the first person to do what the others have been wanting all along, viz. garner enough courage to break free off the limbo they all are existing in and leave the town. The film’s rambling structure with its alternate interjections of humour and poignancy, laced it with a personal, melancholic touch. There were also a few of those dream-like, disconcerting and tad grotesque moments accomplished through brilliant use of shadows and canted camera angles – stylistic aspects that can only be aptly identified by the epithet ‘Felliniesque’.